Bay Design ribbon lamp shades are handmade in Cornwall from luxurious French ribbons. Our unique range of lamp shades and the pendent cluster light fitting enable you to create the perfect accompaniment for your home. Purchase online today, from our latest ribbon collections including seven different lamp shade sizes. Can't find what your looking for? We can colour match to create bespoke lamps for your home or interior design project. New stockists in the South West! 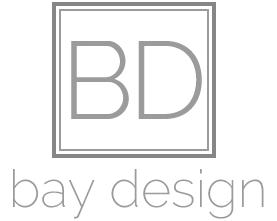 New stockists of Bay Design Lampshades! Really pleased to now be stocking The Duchy of Cornwall Nursery in Lostwithiel, Cornwall and Artenax in Topsham, Devon. The Duchy of Cornwall Nursery offers a first-class selection of garden plants, an award-winning café and a sumptuous shop. Artenax who support British Design, and independent designers producing contemporary high-end interior products. 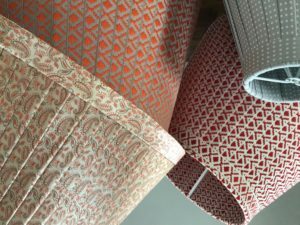 Pretty in pink - design your own lampshade! 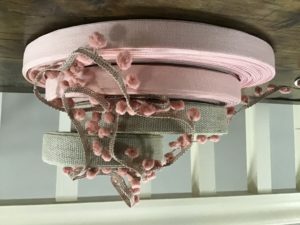 Bay Design has an extensive selection of beautiful French ribbons. 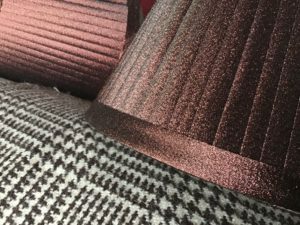 Send your swatches of fabrics or wallpapers to colour match perfectly the right ribbon to suit your interiors. Luxury and glamour with Madeline collection. Available in six sizes to fit candle shades, table lamps to standard lamp bases, this Lampshade is manufactured from sustainable oak cork.